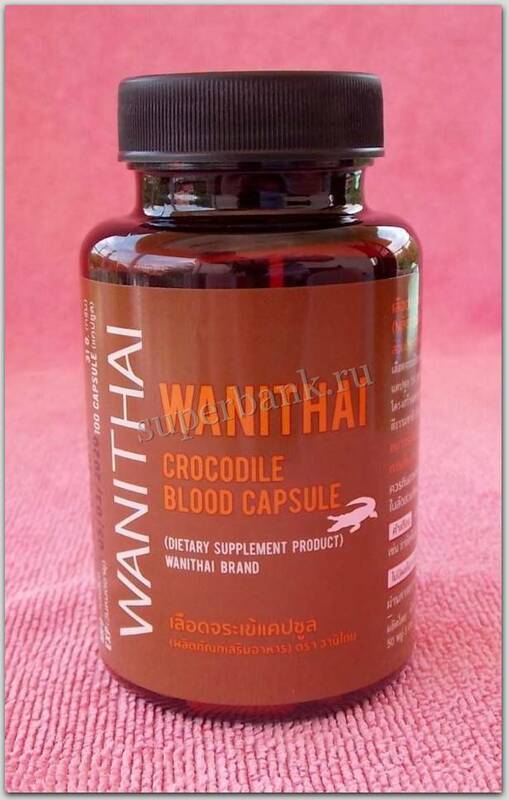 The first crocodile blood product in the world and Thailand based on research studies conducted by the Crocodile Research Unit, Department of Zoology, Faculty of Science. Kasetsart University (KU). In collaboration with private sector, KU has made an effort to enhance clean and safe production process at the acute, sub-chronic, and chronic levels, and to study the efficiency of freeze dried crocodile blood product, which has subsequently approved by the food and drug administration (FDA). Ministry of Publich Health, as a dietary supplement that has been widely known among the public. The research team achieved a study on efficiency of Crocodile Blood Serum in inhibiting bacterial growth and found that it inhibited the growth of many kinds of bacteria. The findings are in agreement with those of the research studies conducted in United States of America, Australia and UK. Moreover a study was conducted to determin feasibility of producing health supplements from Crocodile Blood. In Thailand crocodiles are reared in farms and feed on chicken carcass from standard plants. The crocodile research started with a study of parasites in the blood and intestines of crocodiles from all over the country. A total of 384 crocodiles were used as the research sample in accordance with distribution ratio of crocodiles throughout the country. No parasites were found in the crocodiles. This show that the crocodile blood from captive farms was free from parasites and could be developed as a food supplement. As a result, apparatus for a large volume of blood collection and process for dried crocodile blood preparation were invented in order to achieve a clean and high quality product free from bacterial contamination and made in a form of capsule for easy consumption. A study of crocodile blood in experiment rats was performed and the results presented administration of 5000mg/kg-rat body weight/day or dosage of 6 capsules/day for six months did not cause toxicity to the experiment rats or result in abnormalities of biochemical values in the blood such as Glucose, BUN, Creatine or Alkaline phosphatase, Alanine transaminase. Moreover, it did not cause abnormalities in tissues of kidney, liver, and intestine because if the product was administered more than war the body needs, the excessive quantity would be automatically excreted. There were studies of contaminations in crocodile blood capsules, results show that no contamination of heavy metals (mercury and arsenic), and bacteria causing disease in human, such as E, Coli, Salmonella, and Colostridium were not found. Therefore, Crocodile blood capsules have been approved by the FDA as a dietary supplement product in 2009. Kasetsart University has transferred the production technology exclusively to Wani Thai Limited Partnership* since 2008 Crocodile Blood capsules under the trademark of “Wani Thai” are available in the market and many consumers with Anemia and Diabetes have told the research team that their anemia conditions and blood sugar levels are improved. There was a test to determine the effects of crocodile blood on iron deficiency anemia IDA. It was performed on IDA-induced rats with haemoglobin value of 5.58% gm% and normal rats with the haemoglobin value of 15.4 gm%. After giving the IDA-induced rat freeze dried crocodile blood as supplement food for three weeks in an amount of 250mg/day, their haemoglobin values was improved to 13.7% whereas the hemoglobin value of iron deficiency anemia 8.8gm%. This data shows that IDA rats receiving crocodile blood as a supplement food has normal value of haemoglobin. This is one line with information received from anaemic persons who reported that after consuming freeze fried crocodile blood, they become less fatigue and were able to work better. In addition, the research team continued to keep experiment rats that recovered from anemia and breed them naturally. It was also found that the anaemic rats consuming crocodile blood as supplements throughout the experiment had more offspring than the control and the group with anemia. The data showed that crocodile blood was able to strengthen the body and eating crocodile blood increased a chance for these experiment rats to have more offspring and easier than the control group. Furthermore, after being informed by anaemic persons about the impact of freeze dried crocodile blood a reduction in blood sugar, the research team further studied what substance helped reducing the blood sugar and found that in crocodile blood, there was a great amount of insulin like growth factor (IGF1). The level of IGF1 in freeze dried crocodile blood was not different from that in the fresh blood. Then a research study was done on experimental animals by feeding diabetes-induced animals with the freeze dried blood. It was found that the diabetic rats’ blood sugar was restored to normal levels within 4 weeks after receiving the freeze fried crocodile blood, but they still had diabetes. This showed that freeze dried crocodile blood and plasma could help reducing the blood sugar at a level. Crocodile blood has become a popular food supplement used to promote health due to its hemoglobin levels. The hemoglobin in crocodile blood is different from human hemoglobin. Similar to human, crocodiles breathe through lung but the unique structure of its hemoglobin allows it to breathe under the water. In addition, there are several unique components in crocodile blood that helps protect crocodiles from bacterial infection. In the dirty water with lots of bacteria, crocodiles with a big wound can survive and the wound is healed without any infection. For hygiene, safety and highest benefit, researcher teams from the Kasetsart University, one of the prominent state university in Thailand, and the farm with high standard come together to do research, test and produce the dried crocodile blood capsule using an aseptic and freeze dried process under the name Wani Thai. To prevent any imitation, there is a Wani Thai printing on the capsule. Crocodiles Are NOT harmed during the production of crocodile capsules. Crocodile Blood improves the function of red blood cells in oxygen delivery to all parts of body, including sexual organs. it helps to rejuvenate skin and complexion. In addition, it helps relieve menstrual cramp and infertility in women. Crocodile blood contains a high levels of antibodies that our body can use, it has benefits in patients with AIDs (HIV), allergy or cold and even Cancer. Cancer destroys blood cells as well as decreases blood cell ability. It is appropriate for the use of crocodile blood as a blood tonic to help promote health. Athletes in China and nearby countries use crocodile blood to promote health of athletes and facilitate the recovery. It is also used to stimulate the production of insulin IGF1 for the healing of wounds and decrease the chance of infection. ЭТО ЧУДО! По другому назвать не могу! Моему мужу поставили диагноз - рак предстательной железы 4 ст. В марте месяце обследование УЗИ - размер 118 куб.см. Анализ ПСА -875нг/мл. После приема курса (100шт) крови сиамского крокодила УЗИ - 20 куб.см., ПСА -5,3 нг/мл. Врачи не верят, заставили заново в другом месте проводить обследования. Препарат просто чудо.начала принимать его с февраля месяца. Восстановился менструальный цикл,исчезли приливы. 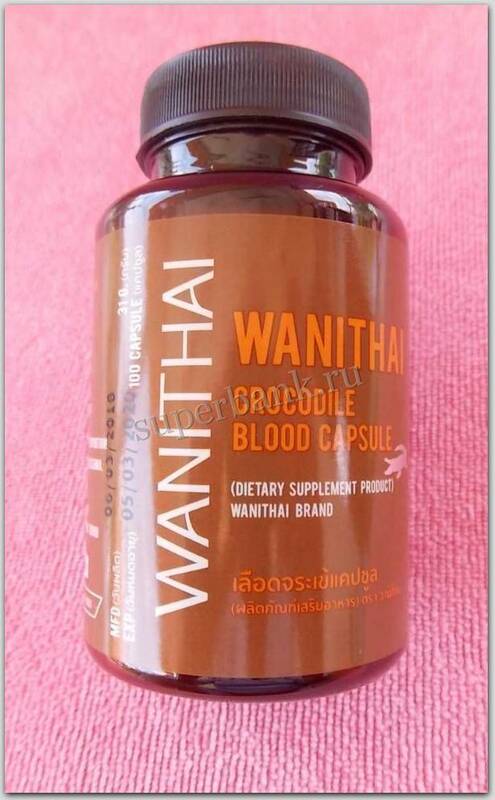 Click the button below to add the "Wani Thai" Crocodile Blood Capsules to your wish list.